When I heard the story the first time, it seemed too good to be true. Someone mentioned to me Raleigh Trevelyan's book Rome'44, The Battle for the Eternal City, in which, according to my second-hand source, there is mention of a daring commando raid up a seaside cliff in Sorrento to save the anti-regime historian and philosopher, Benedetto Croce, from the clutches of the nefarious Germans in WW2. Said Nazis were going to take Croce hostage and force him to eulogize the philosopher of the regime, Giovanni Gentile, who had just been assassinated. The raid was carried out by a paramilitary force that included the son of Axel Munthe, a long-time Capri resident, author, and builder of the mansion that bears his name on the island. As with most second-hand tellings of third-hand readings from those who know someone who read the book, the story was a mish-mash, and without having consulted Trevelyan's book, I am quite willing to give him the benefit of the doubt that that is not quite what he said. The most obvious mess is the connection to Gentile. The relationship between Croce and Gentile is (1) beyond the scope of this brief entry and (2) beyond my own poor powers of historical deconstruction. I do know that they founded a journal together in the 1920s but then went their separate ways when Gentile drafted the "Declaration of Fascist Intellectuals." Croce was an anti-Fascist and spent most of the 1930s and WW2 being hounded by regime goons. As far as this episode is concerned, Gentile was murdered in 1944 and Croce's flight from Sorrento took place in September of 1943. So, that part of it is out, but the real story isn't half-bad, either. Croce deals with the episode in question in a small volume that I have finally had a chance to consult. It is entitled Quando l'Italia era tagliata in due: estratti di un diario [When Italy was cut in two: Extracts from a Diary] and contains daily entries from July 1943 through June 1944. The book (published by Laterza in Bari in 1948) is strangely out of print but was recently reprinted as a photographic copy in a limited edition by Mario Pane, the owner of Villa Tritone in Sorrento, the cliff-top mansion where Croce was living when the episode occurred. Croce had left his residence, the Palazzo Filomarino della Rocca in the historic center of town, and gone to Sorrento to get away from the Allied air-raids on Naples. He moved into the Villa Tritone, a splendid building set on a cliff in Sorrento, overlooking the sea (see photo, above). He was—as he had been in Naples—watched by the authorities, but house arrest in the Villa Tritone does beat a bare-bones prison cell. He originally published these diary excerpts in his Quaderni della Critica in 1946 and 1947 "to correct misconceptions already starting to appear" in the popular press about what had happened in Italy during that period when "only the south" was in the hands of a true Italian government; that is, the Germans were still in control in the north and had even founded their puppet Italian Fascist Republic of Salò. In his entry for August 5, 1943, Croce sadly notes the "horrible destruction" of the venerable Church of Santa Chiara, directly across the street from his home. On September 3, he notes the Anglo-American invasion of Calabria from Sicily. 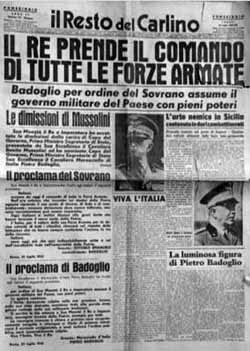 On September 8, Croce mentions the official surrender of Italy to the Allied Forces in the south (headline, left, reports that the king has taken over command of the armed forces). [At that point, the new Italian head-of-state, Pietro Badoglio, went on the radio to tell the citizenry that "the battle continues" —against the Germans and Italian Fascists. Italy was thus plunged into a civil war.] The Germans, of course, did not simply pick up and move north; they fought a very bitter campaign back up the boot of Italy. Three days after the armistice of September 8, the Germans entered and occupied Naples, which Croce mentions in his diary for that day. Croce mentions on September 12 the spectacular rescue of Mussolini from his prison on Gran Sasso in the mountains of the Abruzzi by a glider-borne team of German commandos under Otto Skorzeny. Through all of this, Croce's notes betray no great concern for his personal safety. He ploughed ahead with his considerable intellectual output, working on, say, the poetry of Dante at virtually the same time as the Allies were blowing the bridge at Seiano, a few miles further in on the Sorrentine peninsula. On September 13, Croce writes for the first time that he has received anonymous notes threatening himself and his family, also living at Villa Tritone. On the next day, he reports that there is confusion in Sorrento —no German troops, no Anglo-American forces, but a lot of die-hard Fascists roaming the streets. His advisors tell him that he has to leave immediately. Germans, who can still come over the hills from Salerno, or home-grown Fascists in Sorrento might like nothing better than to take him hostage and use him for propaganda purposes. Croce writes, "I said that there were practical and moral reasons why I couldn't leave. I didn't want a flight on my part to incite panic among the populace." On the other hand, he notes with distaste the uses to which his name might be put by a regime that he has detested for so many years. Then, suddenly, the next day's entry, September 15, is written on Capri. Croce recounts the events of the previous evening, when a floating mine was found in the waters below the Villa. Forces intent on taking him and his family hostage may be setting the stage. The retreating Germans really may come to take him, the way they have already taken other prominent Italian civilians in Salerno as they retreated. He has to go. Now. 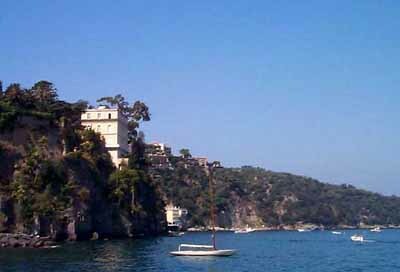 Croce relents and agrees to be taken to Capri, firmly in Allied hands, in a motorboat that has come from that island. He leaves at nine in the evening with three of his daughters as well as with a police commissioner from Capri and an English officer, both of whom have come from the island to rescue him. Croce leaves his wife and one daughter behind to gather up the few things they will need later. He reports the next day that the boat sent back to Sorrento from Capri to pick up his wife and daughter has turned back because of the rumor that the Germans have already invaded the villa and taken the rest of his family. That rumor turns out to be false and on September 17, the same boat, with the same police commissioner, this time accompanied by a "Major Munthe (the son of Axel Munthe)" returns successfully and picks up his wife and daughter. The next day, he is questioned by an English officer for names of "dangerous persons and Fascists" left in Sorrento. He says he is not about to start doing what he has refused to do for so many years —collaborate. Through the whole episode, Croce is deeply saddened— and it comes through even in his low-key prose that his nation is cut in two and he clearly does not want to fuel the fires of acrimony and vendetta by naming names. Later in the week, he writes, the Italian Fascist and German radio stations state that "Croce and others, who have tried the patience of the regime, will be severely punished." At that, the Allies broadcast the news that Croce is safe on Capri. So, there was no great derring-do or cliff-climbing—unnecessary since Villa Tritone has its own stairs down to a private boat landing. But nevertheless, it's a very human drama.